Sue Custer, a talented quiller from Missouri, made this beautiful basket of life-size flowers as one of her design team projects for the May issue of the Custom Quilling newsletter. Zinnias and daisies speak to me of the promise of bright summer days - I'm so ready! 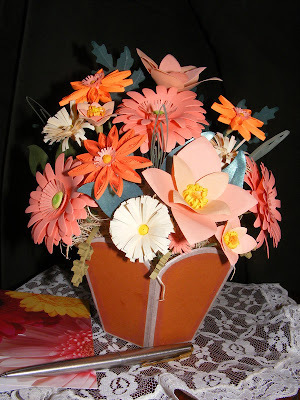 Sue has been quilling since childhood and honed her skill via Quill Art kits that are now considered vintage. That word is used pretty loosely in relation to quilling though, as Sue personally doesn't fall into the vintage category! She used a Sissex die-cutter to make the shapes for some of the flowers and leaves; others are quilled, fringed, or husked. To make the die cut zinnias, she cut away petals from the top two layers and brought edges together to make each layer a bit smaller than the one below. Curving the petals downward adds to the realistic look. Sue covered the collapsible cardboard pot with terra cotta cardstock and applied brown chalk to the edges. If you're interested in paper filigree, but have never visited the Custom Quilling site, clear a block of time as you're in for a treat. Denise Cameron, the owner and a long-time quiller, sells essential supplies for quilling and punch art, as well as lots of helpful items you probably never knew existed. The site is a great resource... online classes, patterns, product reviews, as well as a list of quilling teachers, blogs, groups, and guilds. Be sure to sign up for the mailing list - it's the best way to see each edition of the monthly newsletter. 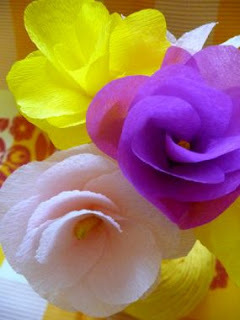 And here's another idea for bright paper flowers - these crepe paper beauties were made by Linda Permann of CraftStylish. She's written a super tutorial that can be found here. Also I love your blog's name. I too am obsessed with paper and actually have been working on paper and fabric flowers for the past 2 months solid. I haven't posted any of them because I'm still so much in the testing phase. Maybe it's time to photograph one or two of those bad boys. Not yet, Kelly, but it's def on my to-do list! Ooh, I hope you'll take some photos of what you've been making - would love to see. Thanks for stopping by.